Get that story out of your head and onto paper! 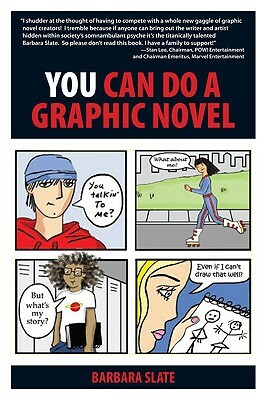 A guide to creating graphic novels- presented in the form of a graphic novel- from a veteran in the field! Barbara Slate is the author of over 300 comic books and graphic novels. She created "Angel Love" for DC Comics; created, wrote, and drew "Yuppies from Hell" and "Sweet XVI" for Marvel; and put her own spin on the Disney classics "Beauty and the Beast, Pocahontas, " and Mattel's Barbie. Her first character, Ms. Liz, appeared on millions of greeting cards, in "Cosmopolitan," and on the "Today" show. Her latest graphic novel is entitled "I Got Married and Other Mistakes." "I shudder at the thought of having to compete with a whole new gaggle of graphic novel creators! I tremble because if anyone can bring out the writer and artist hidden within society's somnambulant psyche it's the titanically talented Barbara Slate. So please don't read this book. I have a family to support!" "Along with all your art supplies, favorite chair, and a good light over your drawing board, you must keep a copy of Barbara Slate's new book You Can Do a Graphic Novel close by. Every chapter is a little gem to help any young (or old) artist/writer. Barabara and I have been friends and co-workers on hundreds of stories and other art projects. I congratulate her on this terrific book and watch out for all my new competition coming into the business after they read Barbara's book. "Barbara Slate has captured the creative process with all its tortures and delights, and produced a great guidebook to anyone who wants to unleash their inner creativity." "Get ready! Barbara will get your creative juices flowing." "Attention, hopeful comic writers: Barbara Slate has given you a helping hand with You Can Do a Graphic Novel, a colorful, funny, and user-friendly way to attain your goal. With Slate's perfect combination of brightly illustrated tips and no-nonsense rules, you'll find that You Can Do a Graphic Novel!"